Yet, conveyor maintenance gets frequently shortchanged due to reduced labor forces, time constraints and budget restrictions. Conveyor runs so well for so long that many people forget that it must be maintained. But you don’t need to add a 25th hour to the day to ensure your system runs reliably. These tips help make sure your system is always ready–and that will be especially important in your peak seasons and critical production timeframes. This is arguably the most important factor in getting the maximum ROI from your automated solution. Making sure your maintenance team heads off any potential issues will set you up for success. Instead of discovering 20 parts that are going to wear out when you least expect it, your maintenance team and equipment operators should stick to a daily, weekly, monthly, and semi-annual inspection schedule. You can also outsource maintenance to factory trained experts. Cisco-Eagle’s maintenance group is dedicated to providing specialized service and maintenance for critical conveyor operations in our core areas. The advantage of this is that your crews are freed for other work while your conveyor is kept in top running condition. We’re capable of very fast response to critical problems – even overnight or on holidays. When performing maintenance on conveyors or any automation, the proper lock-out tag-out procedures should be followed. Refer to your company’s policy for any details. Weekly: Maintenance departments should examine motors and reducers, and clean the conveyor. Check the photoeyes and reflectors for problems like incorrect alignment or cracked/broken reflectors. Daily: Operators should clean any dirt or accumulation of debris from the system, with all rotating parts stopped. Make sure the belt is tracking properly, and check all system controls. 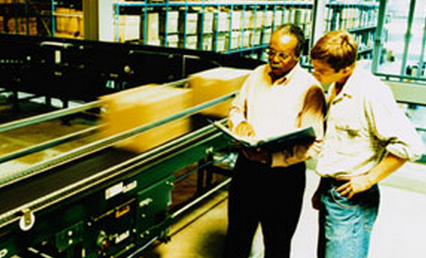 Operators are usually the first to notice when a conveyor needs maintenance, so engage them in the process. When the conveyor is running, listen for any audible clues that something is wrong or in need of maintenance. Is there grinding, slapping, or squeaking? You wouldn’t feel safe driving your car if it was making those noises, and you need to restore your conveyor with simple maintenance. Monthly: Maintenance should examine belt and lacing for damage, tracking, and tension. Lubricate the roller chains and inspect electrical wiring for any physical damage. Semi-annually: Examine master control panel, check the torque of set screws on pulley bearings, and change the fluid in the gear boxes if required by the manufacturer. Ideally, you’re catching wear and tear on components in time to replace them without extended downtime, but that can’t cover all situations. You should also stock critical components to prevent these types of issues when something is damaged or wears out unexpectedly. The quantity of each component in your system: If you have a large system, you may need more replacement parts on hand. But this number won’t jump as drastically as you may think. With a large system, you may need to stock three motors instead of one. This all depends on having a proactive maintenance plan; if you find that you often need to replace many components at once, you will need to have more on hand. The lead time to restock the component: Many components can be shipped to you within 24 hours after you order them. When you have a proactive maintenance team, these pieces of equipment can be replaced in just days. Other more specialized components can take longer, so you will want to keep more of these in stock so that you can replace them as needed without waiting. The conveyor’s importance to the operation: Sometimes a part won’t affect the operation of your system immediately. Other parts are showstoppers—you must keep them on hand to ensure your system isn’t compromised. General rule: if your equipment can’t run without a component, and your business can’t run without that equipment, make sure you have spares. Which parts should you stock? 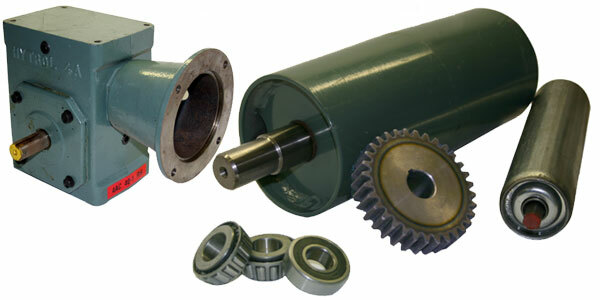 Motors & E24™ motors/powered rollers—Every conveyor needs a motor to run. It’s a no-brainer to have a few motors you can quickly replace any failed components with. Reducers – If a reducer is leaking, it can often keep running while you get a replacement. However, in the case of a gear problem, this part can stop working immediately. Bearings— When a driver bearing goes bad, it can cause a host of problems, including damaging the shaft of a pulley. It’s important to replace this part as soon as possible to keep your system running efficiently. Belts & Lacing—While a belt may not need replaced often, when it does, it can come with extended downtime. You may be able to repair your own belt that has had its lacing ripped out, so it is important to have that on hand as well. Pulleys—A pulley doesn’t normally fail, unless it is damaged by a bearing that needs replaced, as noted above. Keep this on hand in case a bearing misses its proper inspection. Sensors/EZLogic® Controllers—These sensors and photo eyes are what makes zero-pressure accumulation work as it should. Avoid damaging your product and any down time by making sure you can quickly replace them as needed. Air bags & Brakes—When you use accumulation conveyor, keep these spare parts around. O-rings—Inexpensive and relatively small, these are easy to stock and can be used in a variety of equipment. 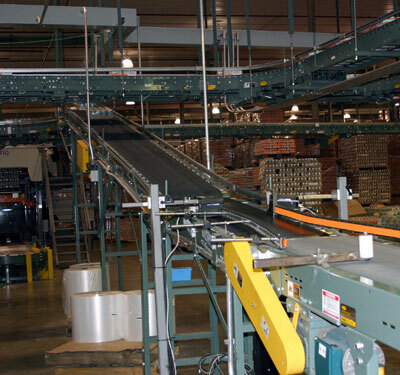 It’s good for business to put the right amount of time, energy, effort and planning into your conveyors. Look, listen, and respond to your equipment. It’s worth every dime and every minute spent on it. Boyce Bonham is the Director of Integrator Services at Hytrol, where he has nearly 30 years of service. You may email Boyce at bbonham@hytrol.com.